One of the organizations we’re proud to partner with at Construction Citizen is Neighborhood Centers in Houston, where they’ve now officially launched a new workforce initiative aimed at helping 1,000 people find living wage, middle-skill jobs. Those are good-paying careers that require more than a high school diploma or its equivalent but less than a four-year degree. The initiative, called ASPIRE, is already connecting people with various training programs. Some of those programs include a cost for the student but others don't cost anything for the individual. Many of the applicants so far are making around $13 to $15 per hour with the goal of transitioning to around $21 per hour. 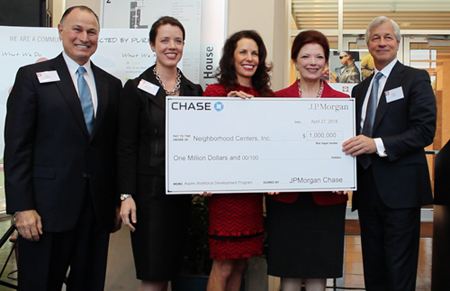 The official kickoff was last Wednesday when JPMorgan Chase President and CEO Jamie Dimon visited Houston to present Neighborhood Centers with a check for $1 million. The contribution is part of a $5 million commitment by the company to help close the skills gap in the area. The bank has committed to $250 million globally for this purpose. In making the donation, Dimon said his travels around the country recently have taught him that different cities have very different needs when it comes to workforce development. Dimon said the thing that impressed him most about Houston is that everyone seems to step up and work together to get things done. Before Dimon spoke, Vaughn Construction CEO Tom Vaughn told the crowd that his company is pleased to be part of ASPIRE. Vaughn’s father, Joe Vaughn, began working in construction at the age of 12 as a laborer and eventually worked his way up through the trades to become head of his own large company. Because of what he called a “builder’s spirit,” Vaughn said his firm puts the emphasis on the worker and what they do in the field. “It makes us successful,” he said. “It’s a pretty cool day, right?” she said. Part of the philosophy of Neighborhood Centers is that a city’s success shouldn’t be judged based on whether it’s walkable or whether it’s home to great museums. “The measure of a great city is whether you can come here and start with nothing and have a life different than the one you were born into,” she said.